Apple is finally offering a self-branded Thunderbolt 3 cable on its online store, the first cable of its kind manufactured by Apple and not a third-party company. 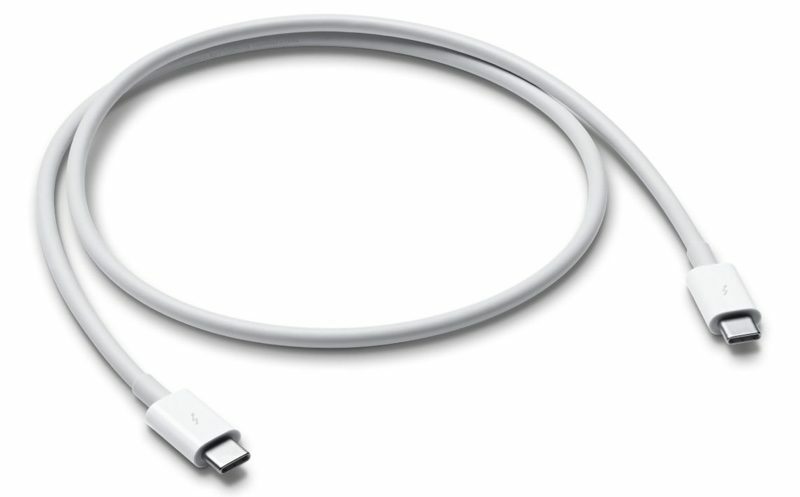 Apple’s new Thunderbolt 3 cable in available in a 0.8m length and comes in at a $49.00 CAD price point. Apple has yet to mention whether it plans on releasing the cable in different lengths. Previously, Apple had only stocked a Thunderbolt 3 cable from Belkin, as it wasn’t selling one of its own. However, Apple still sells the Belkin cable, which comes in 0.5m and 2m sizes, priced at priced at $39.95 and $79.95, respectively. The cable allows for TB3 data transfer speeds up to 40GB/s, and USB 3.1 Generation 2 data transfer speeds of up to 10GB/s. The Thunderbolt 3 cable also features DisplayPort output (HBR3) and charging up to 100W. It’s important to not confuse the new Thunderbolt 3 cable with Apple’s line of USB-C cables, which don’t support the same high-speed data transfer speeds and are only intended to be used as charging cables for the USB-C MacBook power adapters only. Apple debuted the Thunderbolt 3 cable on the same day the iMac Pro became available for pre-order, which itself features 3 Thunderbolt 3 ports. Check out the cable on Apple’s website.